Brothers and sisters in Christ grace and peace to you from God our Father and our risen Lord and Savior Jesus. Amen. As a pastor, I get asked one question more than just about any other. It’s this – “will you/can you pray for me?” Of course my answer to that question is always yes, but most of the time I will also say to the person asking me to pray for them, if they will pray for me as well. Whenever I think of prayer, I think of my grandmother. It’s always important for her to know that I pray for her. And it’s not necessarily just because I’m her grandson and she knows I love her, it’s also because I’m a pastor and she thinks I have a closer connection or wifi signal to God as I offer prayer for her. I think prayer is one of the most misunderstood aspects of our life in Christ. I also think that if we believe that pastors have some special connection to God hearing our prayer that is better than everyone else, we may never get any closer to understanding the significance of prayer in our own life of faith. John 17 is one of the most dense and challenging pieces of scripture there is. There is no way that I’m going to attempt to uncover all of the nuances of this chapter today. BUT – what I hope to do is highlight a few parts of this final prayer of Jesus that have spoken to me for many years and continue to speak to me today. It’s important to understand a little about the context of this prayer that we hear Jesus offer. The 17th Chapter of John takes place in Jerusalem shortly before Jesus’ crucifixion. Many believe it is probably in the same room where the Last Supper was held. Jesus last prayer in the other gospels takes place in the garden of Gethsemane with Jesus being alone. In John 17 Jesus is not alone and this is not a private time of prayer. This prayer was written not only so followers of Jesus centuries later could read it, but also so followers like us could hear it again and again just like the first time Jesus offered it in the presence of his disciples. So who is Jesus praying for? In the first section of this prayer, Jesus is offering prayer for his own mission and ministry in the world and thanksgiving for how his relationship with God has shaped this mission. One of the most significant struggles that I have with prayer is the pressure that I feel to sometimes be something that I am not in my prayer life. You know the kind of prayer I’m talking about? Just follow these 7 steps of prayer or pray in this specific way. If you do that, you’ll behave and look and feel more like the Christian you’re supposed to be. We become so focused on doing something or becoming some sort of super-hero prayer warrior that we fail to simply be followers of Jesus who pray. I’ve always wondered how the people who want me to pray in these systematic ways know what kind of Christian God is calling me to be? For Jesus, prayer is a gift. And the best part of this gift is relationship with God through Jesus. No one specific prayer formula is going to work for everyone in growing their relationship with God. Our prayer life is not dependent upon the techniques we use when we pray. Starting at verse 9, the second section of this prayer, Jesus is offering prayer for the community of followers – those God has given to Jesus. He is offering prayer for protection and unity for that community. Do you believe that God is protecting you? Do you pray for protection – for yourself or someone you love? Have you ever prayed for unity – whether with yourself or with others? I mean, what do you think the world would look like if the nearly 40,000 Christian denominations that exist today were really and truly united as one as Jesus is praying for in John 17? Brothers and sisters in Christ, one of the reasons why I love this chapter in John’s gospel is that it is a powerful reminder for all of us who seek to follow the risen savior Jesus. A powerful reminder that Jesus not only prays for himself and his mission, but also for his disciples and the entire church. The church – for you and me. I believe that is still true today. The relationship to which you and I are invited to participate in with God through our savior Jesus Christ is very intimate – prayer is a significant piece of living in this intimate relationship. So, who does Jesus pray for? Jesus does not just pray for the disciples Peter, James, and John. He also prays for saints like Augustine, Benedict, Francis, and Theresa. He brings Calvin and Wesley, Luther and Whitefield before His Father, as well as Billy Graham and Desmond Tutu and Martin Luther King, Jr.
Brothers and sisters in Christ, what do you want Jesus to know? What do you need Jesus to know? What do you want prayer for, not just from your pastor or a close friend? Jesus prays for you. What do you want Jesus to pray for? 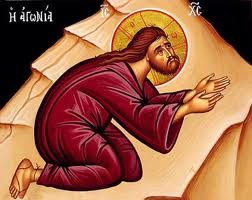 This entry was posted on Monday, May 21st, 2012 at 9:01 pm	and tagged with Gospel of John, High Priestly Prayer, Jesus, Jesus Christ and posted in Recent Sermons. You can follow any responses to this entry through the RSS 2.0 feed.